This page describes all the platforms that have a rerecording emulator that is approved for site submission. You can also check the framerates for each one of these platforms. The Nintendo Entertainment System (also abbreviated to NES or simply called Nintendo) is an 8-bit video game console that was released by Nintendo in North America during 1985, in Europe during 1986 and Australia in 1987. In most of Asia, including Japan (where it was first launched in 1983), China, Vietnam, Singapore, the Middle East and Hong Kong, it was released as the Family Computer (ファミリーコンピュータ Famirī Konpyūta), commonly shortened to Famicom (ファミコン Famikon) or abbreviated to FC. In 1986, Nintendo released the FDS in Japan, a type of floppy drive that used a single-sided, proprietary 2" disk and plugged into the cartridge port of the Famicom. It contains RAM for the game to load into and an extra FM synthesis sound chip. The Super Nintendo Entertainment System (also known as the Super NES, SNES or Super Nintendo) is a 16-bit video game console that was released by Nintendo in North America, Europe, Australasia (Oceania), and South America between 1990 and 1993. In Japan and Southeast Asia, the system is called the Super Famicom (スーパーファミコン, officially adopting the abbreviated name of its predecessor, the Family Computer), or SFC for short. In South Korea, it is known as the Super Comboy (슈퍼 컴보이) and was distributed by Hyundai Electronics. The Virtual Boy (バーチャルボーイ Bācharu Bōi) is a video game console developed and manufactured by Nintendo. It was the first video game console that was supposed to be capable of displaying "true 3D graphics" out of the box. Whereas most video games use monocular cues to achieve the illusion of three dimensions on a two-dimensional screen, the Virtual Boy creates an illusion of depth through the effect known as parallax. In a manner similar to using a head-mounted display, the user looks into an eyepiece made of neoprene on the front of the machine, and then an eyeglass-style projector allows viewing of the monochromatic (in this case, red) image. The Nintendo 64 (ニンテンドウ64 Nintendō Rokujūyon), often referred to as N64, is Nintendo′s third home video game console for the international market and its first truly 3D console. Named for its 64-bit CPU, it was released in June 1996 in Japan, September 1996 in North America, March 1997 in Europe and Australia, September 1997 in France and December 1997 in Brazil. The Nintendo GameCube (ニンテンドーゲームキューブ), officially abbreviated to NGC in Japan and GCN in other regions, is a sixth generation video game console released by Nintendo on September 15, 2001 in Japan, November 18, 2001 in North America, May 3, 2002 in Europe, and May 17, 2002 in Australia. It was the successor to the Nintendo 64 and featured greatly improved technical specifications. The Wii is a home video game console released by Nintendo on November 19, 2006. As a seventh-generation console, the Wii primarily competed with Microsoft's Xbox 360 and Sony's PlayStation 3. Nintendo stated that its console targets a broader demographic than that of the two others. As of April 2012, the Wii was leading the generation over the PlayStation 3 and Xbox 360 in worldwide sales, and in December 2009 broke the record for best-selling console in a single month in the United States. The Game Boy (ゲームボーイ Gēmu Bōi), is an 8-bit handheld video game device developed and manufactured by Nintendo. It was released in Japan on April 21, 1989, in North America in August 1989, and in Europe on September 28, 1990. It is the first handheld console in the Game Boy line, and was created by Gunpei Yokoi and Nintendo Research & Development 1—the same staff who had designed the Game & Watch series as well as several popular games for the Nintendo Entertainment System. The Super Game Boy (スーパーゲームボーイ Sūpā Gēmu Bōi) is a 16-bit adapter cartridge for Nintendo's Super Nintendo Entertainment System, as well as the Super Famicom in Japan. The Super Game Boy allows game cartridges designed for use on the Game Boy to be played on a TV display using the SNES/Super Famicom controllers. When it was released in 1994, the Super Game Boy sold for about $60 in the United States and £49.99 in the United Kingdom. It was the precursor to the Game Boy Player on the Nintendo GameCube, which had a similar function. The Game Boy Color (ゲームボーイカラー Gēmu Bōi Karā") is Nintendo's successor to the 8-bit Game Boy handheld, and was released on October 21, 1998 in Japan, November 19, 1998 in North America, November 23, 1998 in Europe and November 27, 1998 in the United Kingdom. It features a color screen and is slightly thicker and taller than the Game Boy Pocket. Like the original Game Boy, it has an 8-bit processor, and is backwards compatible with all Game Boy games. The Game Boy and Game Boy Color combined have sold 118.69 million units worldwide. The Game Boy Advance (ゲームボーイアドバンス Gēmu Bōi Adobansu), often shortened to GBA, is a 32-bit handheld video game console developed, manufactured and marketed by Nintendo. It is the successor to the Game Boy Color. It was released in Japan on March 21, 2001, in North America on June 11, 2001, in Australia and Europe on June 22, 2001, and in the People's Republic of China on June 8, 2004 (excluding Hong Kong). The Nintendo DS (ニンテンドーDS Nintendō DS), abbreviated to DS or NDS, is a portable game console produced by Nintendo, first released on November 21, 2004. A distinctive feature of the system is its two separate LCD screens, the lower of which is a touchscreen. These are encompassed within a clamshell design, similar to that of the Game Boy Advance SP. The Nintendo DS also features a built-in microphone and supports wireless standards, allowing players to interact with each other within a short range, or online with the Nintendo Wi-Fi Connection service. The Nintendo DS is the first Nintendo console to be released in North America before Japan. The PlayStation (プレイステーション), officially abbreviated as PS and unofficially as the PSX or PS1, is a 32-bit fifth-generation video game console, first released by Sony Computer Entertainment in Japan on December 3, 1994. The PlayStation was the first of the PlayStation series of home and handheld consoles. In 2000, a re-designed, "slim" version was released, called the PSone, which replaced the original grey console. The new name was intended to avoid confusion with its successor, the newly-released PlayStation 2. The Sega SG-1000 is a third-generation 8-bit video game console and Sega's first ever home console. It was released in 1983 on the same day that Nintendo released the Famicom in Japan. While it wasn't popular, and was never released outside Japan, it became the basis for the internationally successful Sega Master System (a.k.a. SG-1000 Mark III). The Sega Master System is a third-generation 8-bit video game console by Sega. It is essentially an upgraded and redesigned Sega SG-1000, with hardware superior to the NES, and was released as a direct competitor to that console. Its hardware is also closely related to that of Sega's handheld console at that time, the Sega Game Gear. The Sega Genesis is a fourth-generation video game console developed and produced by Sega. It was originally released in Japan in 1988 as Mega Drive (メガドライブ Mega Doraibu), then in North America in 1989 as Sega Genesis, and in Europe, Australia and other PAL regions in 1990 as Mega Drive. The reason for the two names is that Sega was unable to secure legal rights to the Mega Drive name in North America. The Sega Genesis is Sega's third console and the successor to the Sega Master System with which it has backward compatibility when the separately sold Power Base Converter is installed. The Sega 32X is an add-on for the Sega Genesis console, featuring 2 32-bit CPUs which expanded the processing capabilities of the console. The Sega CD, released as the Sega Mega-CD in most regions outside North America, is an add-on for the Sega Genesis console. It features a CD-ROM drive which expands the game storage capabilities of the console. The Sega Saturn (セガサターン Sega Satān) is a 32-bit fifth-generation video game console that was first released by Sega on November 22, 1994 in Japan, May 11, 1995 in North America, and July 8, 1995 in Europe. It was the successor to the Sega Genesis and was mainly meant to compete with the PlayStation. The system was discontinued in North America and Europe in 1998, and in 2000 in Japan. The Sega Game Gear is a fourth-generation handheld video game console developed by Sega. It was their first handheld console and primarily competed with the Game Boy, Atari Lynx and NEC's TurboExpress. Its full-color backlit landscape screen was ahead of its time, though the power needed to run it hampered the system's battery life. It has hardware similar to the Sega Master System, and can play Master System games through an adapter. The TurboGrafx-16, fully titled as TurboGrafx-16 Entertainment SuperSystem and known in Japan as the PC Engine (PCエンジン Pī Shī Enjin? ), is a video game console developed by Hudson Soft and NEC, released in Japan on October 30, 1987 and in North America on August 29, 1989. The "16" in its name refers to the console's 16-bit processor, similar to the "64" in the name of the Nintendo 64. As a 16-bit console, the TG-16 ended up competing against the SNES and Sega Genesis. The TurboGrafx-16 was the first video game console to have a CD-ROM peripheral, which was first released as the PC-Engine CD-ROM2 in Japan in April 1988, then released in the United States as the TurboGrafx-CD in 1990. The SuperGrafx is an upgraded version of the PC Engine released exclusively in Japan, primarily in response to the Super Famicom. Originally announced as the PC Engine 2, the machine was purported to be a true 16-bit system with improved graphics and audio capabilities over the original PC Engine. Only seven games were produced that took advantage of the improved SuperGrafx hardware. The Atari 2600 was released in October 1977 by Atari, Inc. It is credited with popularizing the use of microprocessor-based hardware and ROM cartridges containing game code, instead of having non-microprocessor dedicated hardware with all games built-in. The Atari 7800 was released in January 1986 to compete with the NES and Sega Master System. It featured digital joysticks and was backwards compatible with Atari 2600 cartridges, expanding its game library and making it the first system to support an earlier console's games without requiring additional modules. The Atari Lynx is a 16-bit handheld game console that was released by Atari Corporation in 1989. The Lynx holds the distinction of being the world's first handheld electronic game with a color LCD. MSX is a standard for home computers, established in 1983 by ASCII Corporation (which was at that time part of Microsoft Japan). There are several evolutions of the standard: MSX (1983), MSX2 (1985), MSX2+ (1988) and MSX turboR (1990). The later evolutions are backwards compatible with the earlier ones. MSX computers were not successful in the US, but they were in Japan, the Middle East, the USSR, the Netherlands, Spain, Brazil and to a lesser extent, several other European countries. It is difficult to estimate how many MSX computers were sold worldwide, but eventually 5 million MSX-based units were sold in Japan alone, many of which were the later models. As it is a standard, many manufacturers created computers which adhered to it. Examples are Panasonic, Sony, Sanyo, Philips, Canon, Casio, Daewoo, Hitachi, JVC, Mitsubishi, Samsung, Toshiba and SpectraVideo. The image shown here is the Panasonic FS-A1WSX, a Japanese MSX2+ computer. DOS, short for Disk Operating System, is an acronym for several closely related operating systems released for personal computers in the 1980s and 1990s. The most popular and well-known is Microsoft's MS-DOS. Microsoft Windows is a family of graphical operating systems that has long been the most popular OS available for home computers. Today, special versions of Windows are available on some smartphones and tablets as well as the Xbox One game console. 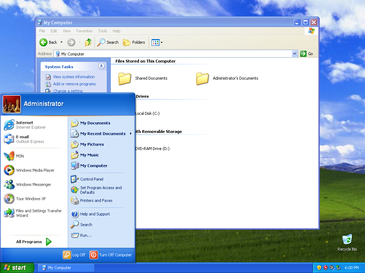 The image shown here is of Windows XP, currently the most compatible Windows version for rerecording. The TI-83 series of graphing calculators is manufactured by Texas Instruments. The original TI-83 is itself an upgraded version of the TI-82. Released in 1996, it is one of the most used graphing calculators for students. In addition to the functions present on normal scientific calculators, the TI-83 includes function graphing, polar/parametric/sequence graphing modes, statistics, trigonometric and algebraic functions. Although it does not include as many calculus functions as the TI-82, applications and programs can be downloaded from certain websites or written on the calculator. The ColecoVision is an 8-bit home video game console from Coleco Industries, released in August 1982. It was notable for offering near-arcade-quality graphics and gaming style, and as such became the main platform for many arcade game ports of its time. The Intellivision is a home video game console released by Mattel Electronics in 1979. The name Intellivision is a portmanteau of "intelligent television". Development of the console began in 1978, less than a year after the introduction of its main competitor, the Atari 2600. The Commodore 64, also known as the C64, is an 8-bit home computer introduced in January 1982 by Commodore International. It is listed in the Guinness Book of World Records as the highest-selling single computer model of all time, with independent estimates placing the number sold between 10 and 17 million units. One of its features, the SID sound chip, was praised as "a true music synthesizer", superior to many of the other consoles' sound capabilities at the time. The Apple II was an 8-bit home computer made by Apple. It was introduced in 1977 at the West Coast Computer Faire by Jobs and was the first consumer product sold by Apple Computer. It is the first model in a series of computers which were produced until Apple IIe production ceased in November 1993. The Uzebox is a retro-minimalist homebrew game console. More info here. WonderSwan was a line of handheld game consoles produced in Japan by Bandai between 1999 and 2003. The original WonderSwan was later replaced by the WonderSwan Color; although some WonderSwan Color games are compatible with the original WonderSwan, many are designed exclusively for the WonderSwan Color and show a message such as "This cartridge is for WonderSwan Color only" when run on the original WonderSwan. The Neo Geo Pocket is a monochrome handheld video game console released by SNK. It was the company's first handheld system and is part of the Neo Geo family. It debuted in Japan in late 1998, however saw no western release, being exclusive to Japan and smaller Asian markets. The Neo Geo Pocket was immediately succeeded by the Neo Geo Pocket Color, a full color device allowing the system to compete more easily with the dominant Game Boy Color handheld. Arcade machines have a long history and are made of a large variety of hardware types. Machines built from Capcom CPS-1 and CPS-2 hardware, SNK Neo Geo hardware, Toaplan hardware, Cave hardware, and various games on miscellaneous hardware are supported for rerecording via FinalBurn Alpha. The ZX Spectrum is an 8-bit personal home computer released in the United Kingdom in 1982 by Sinclair Research.